Comedians Bob Elliott and Ray Goulding lampooned all things American on their show. Thanksgiving, spelling bees, the post office, and the common cold were all fair game for Bob and Ray. The men were their own co-stars, creating a slew of comical characters, including women. There was usually plenty of singing by Bob, Ray and their characters, many of whom couldn’t carry a tune. 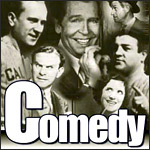 The show may have been best known for its parodies of soap operas, detective shows, variety shows, melodramas and every other type of radio program being broadcast at the time. They never used a script and it never mattered, it seemed that Bob and Ray could almost read each other’s minds when they were on the air.